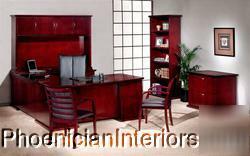 This is a completely customizable office furniture collection. Maple Office Furniture Collection is designed for maximum versatility and flexibility in any office environment…from large commercial applications to the home office. Construction is Maple and Cherry Woods. Warp-resistant honeycomb designed desktops. Solid wood cores. Seven layer polyester finish with high gloss sheen for the toughest scratch resistance available. Each bookcase single shelf supports up to 200lbs and is adjustable. Central locking system on all pedestals. File drawers accommodate both letter and legal hanging files. All units feature levelers for uneven flooring. The best commercial office system available! Standard Curbside Delivery is Included to a Continental U.S address. To upgrade to In-Home Delivery and Set-up, inquire for pricing. All items are packed with industrial strength packaging and cushioning. All furniture is automatically "Insured" at no additional cost to you! So in the event of a mishap or damage, you will not wait for ever for a simple replacement! All we ask is that you call us immediately to report any problems so we may expedite return, repair or replacement for you we do not burden you with that task like other furniture sellers do!